Some of us are always looking for the wild places. No homes, no skyscrapers, no restaurants or coffee shops, no cell services, no people. Just you and the wild. The Jumbo Pass in the Purcell mountain range of British Columbia is such a place. 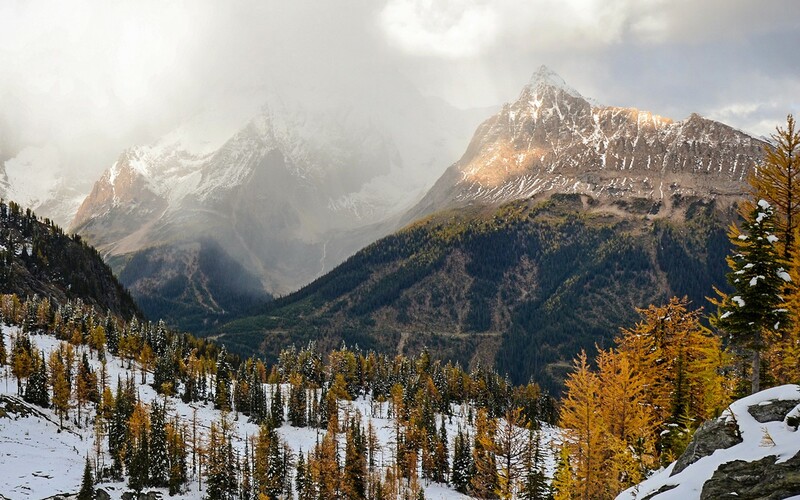 While Canada’s Rocky Mountain parks see tourists and adventure seekers by the millions each year, just one mountain range west, the Purcell Range offers virtually unexplored beauty that rivals that of the national parks. The pinnacle of hiking in the Purcell Range is the Jumbo Pass. My wife, Shawna, and I hiked Jumbo twice this year – once in August, and once again in September. One thing about hikes in the Purcells, you typically have to work to get to them. The Jumbo Pass hike is only accessible by logging road, requires a high clearance vehicle, and is only accessible a few months a year – usually late June to early October. Good planning and early rising are both essential. Let me preface this with one solid statement. I am not a morning person. We arrived at the trailhead around noon both times we hiked the trail, and each time we only returned to our car around sunset. The drive to the trailhead is an adventure in itself. If you’re doing this hike, allot extra time for photo stops on the drive. With gorgeous views of the Toby Creek, Jumbo Creek, Mount Brewer, and much more, you will likely be stopping a lot. After an hour and a half of driving on dirt roads, over multiple bridges and driving through a small creek, you’ll reach the trailhead. The trail begins at a non-distinct stop along the road with a widened shoulder, space for maybe a half-dozen vehicles to park. Watch for the brown trail sign on the left, it’s easy to miss. The real fun begins on the trail. From the parking lot to the Jumbo hut hikers gain 670 meters (2200 feet) over 6.1km (3.8 miles). The hike winds through lush forest and alongside a babbling brook. As you gain altitude, make sure to look behind you as the valley opens up. The trees gradually thin. Hikers are rewarded for their ascent with the panoramic vista of the Jumbo Valley, with Karnak and Jumbo Mountains to the north-east. The plateau of the pass offers soaring views eastward, giving a new perspective to all the mountains hikers drove past to reach the trailhead. Southeast, Mount Bastille is an incredible sight. Further into the pass will lead hikers to views of the surrounding peaks reflecting in the mountain tarns, and of the Cauldron and Horseshoe glaciers in the distance. 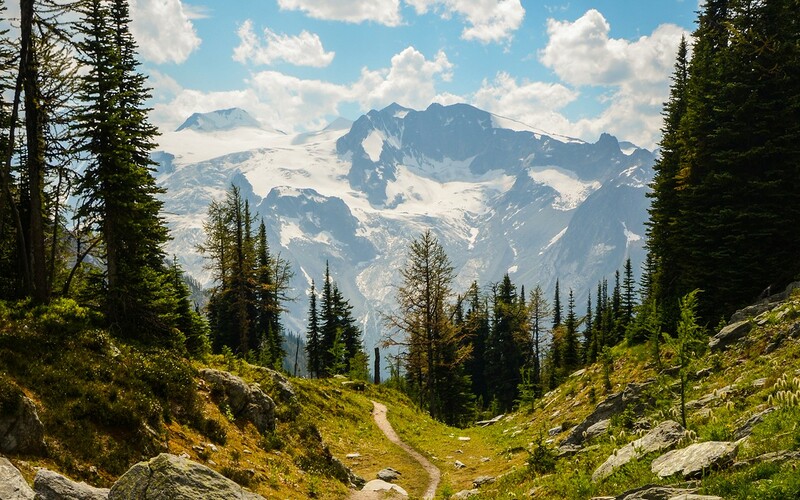 Eventually, a crossroads is reached, where a left fork will take hikers into the West Kootenays, while the main trail continues another 0.5km (0.3 miles) to the Jumbo Pass Alpine Hut. This site is comprised of a one-room hut that sleeps eight and two outhouses. Camping is permitted around the hut, but no fires are allowed in summer as wood needs to be flown in by helicopter. 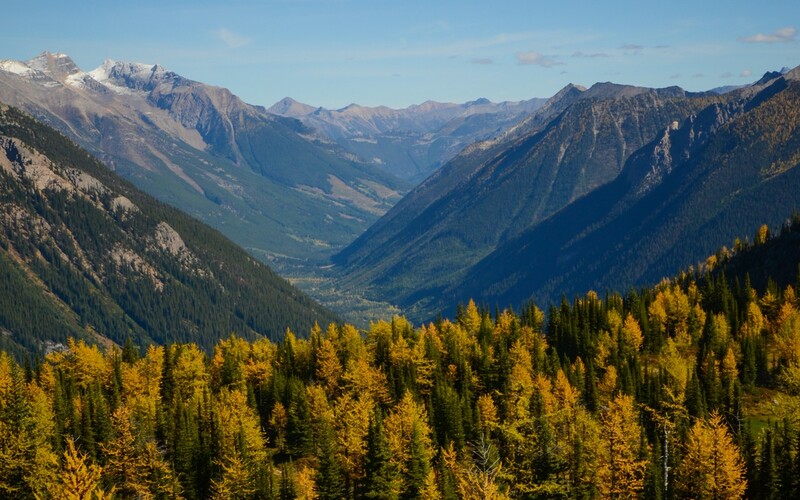 The hut is managed by the Columbia Valley Hut Society and can also be rented at a rate of $75CAD per night with a maximum stay of four nights. The trail to the hut can be extended up a ridge just behind the cabin for elevated view of the pass. The Jumbo Pass changes drastically from season to season. In summer wildflowers carpet the pass, but only last a very short time. If you can visit during wildflower season, in early to mid-August, you find a magical place brimming with colour. 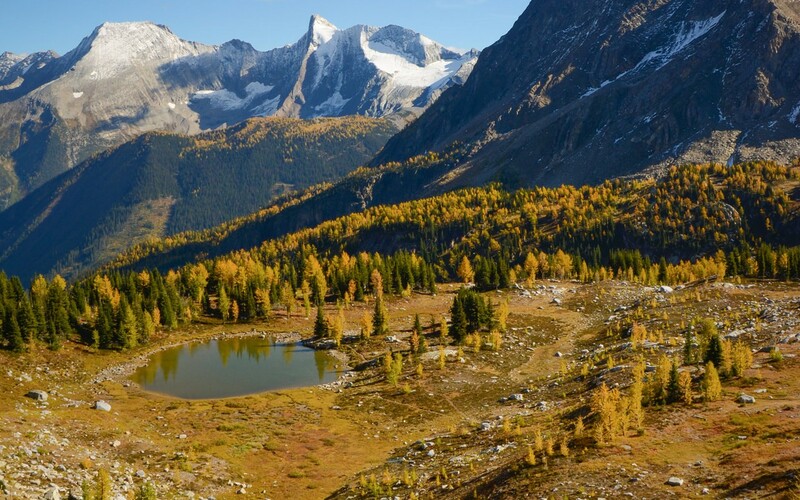 Autumn descends early in the alpine, and by mid-September the larch have changed colour, glowing a golden bright. In winter the pass is accessible by snow machine, and helicopter. It is a renowned for it’s ski touring options. There are still wild places in the world, but few offer the majesty that can be found in this little corner of British Columbia. The Jumbo Pass will hopefully remain wild, ready for adventure seekers to explore, for decades to come.